The Inventory Toolkit is an indispensable guide for operations management professionals who are looking to improve effectiveness of inventory management and Manufacturing Resource Planning (MRP) activities within their organisations. Looking beyond the complexity and theory of inventory management, authors Geoff Relph and CatherineMilner examine managing inventory and achieving targets. Whilst the first edition mainly focused on planning, this new edition of The Inventory Toolkit includes three new chapters that go beyond planning to implementation. Amongst other topics, the new chapters cover holding and moving inventory, working with suppliers and using stack and flow to identify pinch points and facilitate lean and agile operations. 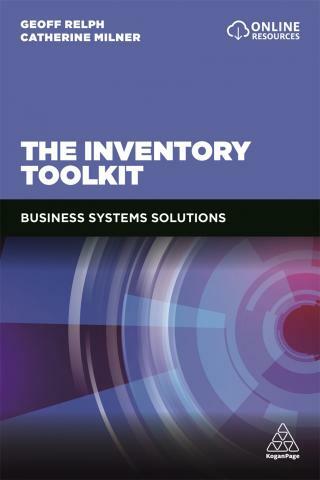 The Inventory Toolkit examines how inventory management should work and how to plan, control and balance it. Many tools and techniques are included, from basic Pareto, through EOQ, to the inventory exchange carve. Practical advice is given throughout, including the creation of the advanced K curve methodology. This comprehensive and greatly extended second edition of inventory management is illustrated with many case studies from diverse industries such as manufacturing, retail and utilities. Worked examples and regular exercises are used to show how the reader can create and apply in a practical way the inventory tools discussed. The book will be published by Kogan Page on 3rd July 2019. Available to pre-order from 3rd April 2019.